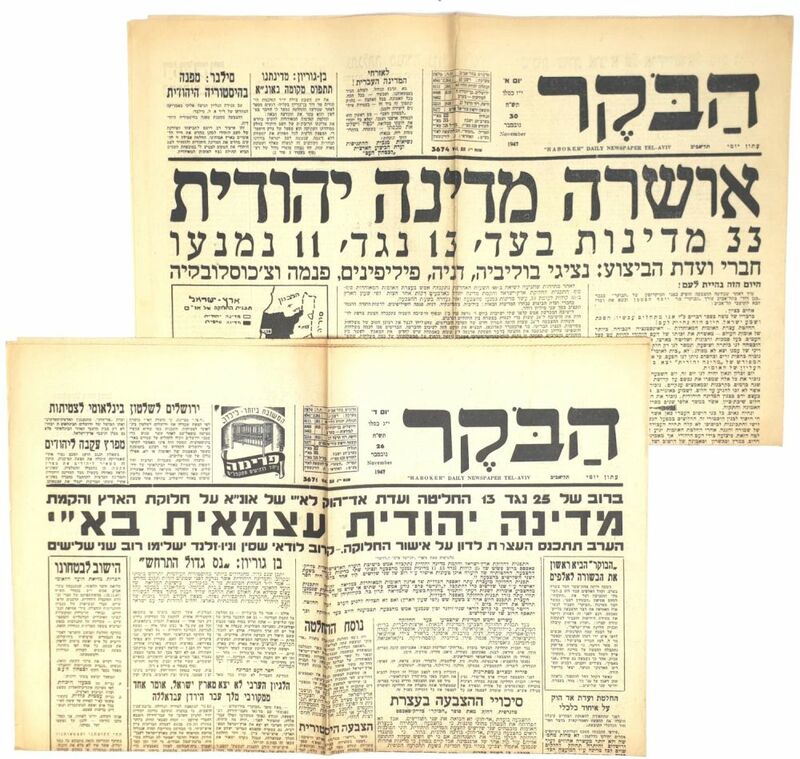 Large collection of 97 HaBoker newspapers 1947-1948, including important issues of the newspaper covering these two fateful years in the history of the Jewish state. Among the issues, there is a HaBoker newspaper from November 26 1947, headlined, "With A Majority Of 25 To 13 The Ad-Hoc Committee Has Decided ... To Divide The Land And The Establishment Of An Independent Jewish State In The Land of Israel, newspaper from November 20, 1947 headlined, "A Jewish State Has Been Authorized - 33 Countries In Favor, 13 Against, 11 Abstained," newspaper from 30/11/1947 headlined "Rejoicing and Vigilance for the State of Jews" newspaper from 1/12/1947 headlined, "The Jewish State Is A Fact! The Arabs Must Recognize It," newspaper from November 17, 1947 headlined, "794 illegal immigrants from Kadimah expelled, 185 Illegal Immigrants From Aliyah immigrated," and more.